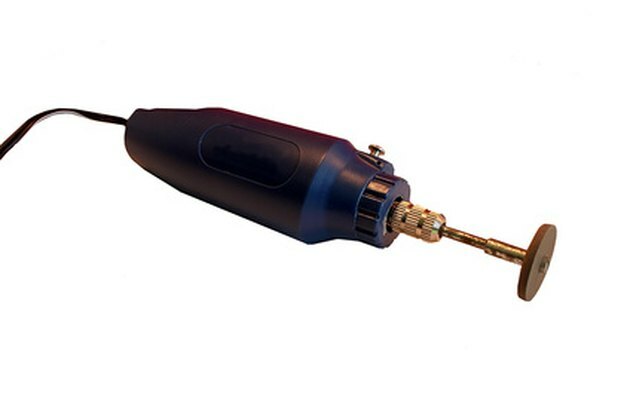 A Dremel is a hand-held, motorized rotary device that you can outfit with a number of different types of attachments for carving, cutting, etching, sanding and other applications. While Dremel is actually the brand name of a particular line of rotary tools, people use the term colloquially to refer to any hand-held motorized tool with a similar design and function. If you are working with a Dremel for the first time, there are beginner-level projects that can help you familiarize yourself with the tool. For this project you will need, in addition to your Dremel, a piece of paper, a pen, tape and a candle that has a large diameter and lots of surface area. According to Dremel, start by drawing shapes or patterns on the paper, such as dots, wavy lines, flowers and leaves. Next, wrap your paper around the outside of the candle, and tape it in place. By tracing over your designs, you can transfer a light imprint of them on to the candle. Remove the paper once your tracing is complete, and secure an engraving attachment, which is pencil-shaped and ends in a fine point, on to the top of your Dremel. You can now turn on the tool, and trace over the design imprint on the candle. Make sure to wipe away the bits of wax that fall off as you progress. The objective of this project is to create a functional, weather-resistant, candle-powered lamp out of a terracotta pot. Terracotta is an unglazed, brownish-red ceramic-like material that is quite sturdy. However, you should have little trouble cutting through it with a spiral cutting attachment, which features a series of grooves at its end. Start by standing the terracotta pot upside-down, so it resembles a lampshade, and draw some large, basic shapes on its sides. Possible design options for a beginner include moons and hearts. The more complicated the design, the more cuts it requires, and the more difficult it will be. Next, holding the Dremel perpendicular to the side of the pot, cut out your shapes, nice and slowly, with the cutting attachment. You can then smooth over the sharp edges of the shapes using a grinding stone attachment. Once complete, light a candle, stick it under your pot and watch the shapes light up. While this beginner Dremel project is not as fun as the above two, it is the most practical of the bunch. According to Dremel, start by disconnecting and removing your car battery from your vehicle. Next, secure a brass brush attachment to your Dremel, and go to work grinding away the rust and other corroded bits on the positive and negative terminals of the battery. You can also grind away the corrosion on the battery clamps inside of your vehicle, which attach to the battery terminals. This will help ensure a smooth, uninterrupted connection between your battery and the electronic components in your car.